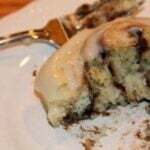 Cinnamon rolls without yeast are easy with no waiting on the dough to rise! Filled with brown sugar and cinnamon and topped with cream cheese icing, these are a special breakfast treat! We’ve had lots of 20-somethings at our house for the past few weeks. Malorie and a couple of her friends came up for a weekend to do some shopping, while the same weekend Brian and his girlfriend, Caroline, were also here visiting. Usually a houseful of young people means breakfast can be something easy and sweet—chocolate chip muffins, French toast casserole, blueberry muffins, or one of their favorites, these no yeast cinnamon rolls. Add a bowl of fruit and some orange juice and that’s all the breakfast they require. These cinnamon rolls are sinfully delicious, which just means they have lots of butter, sugar and cream cheese. But who’s counting calories when you’re hanging out with friends and family? 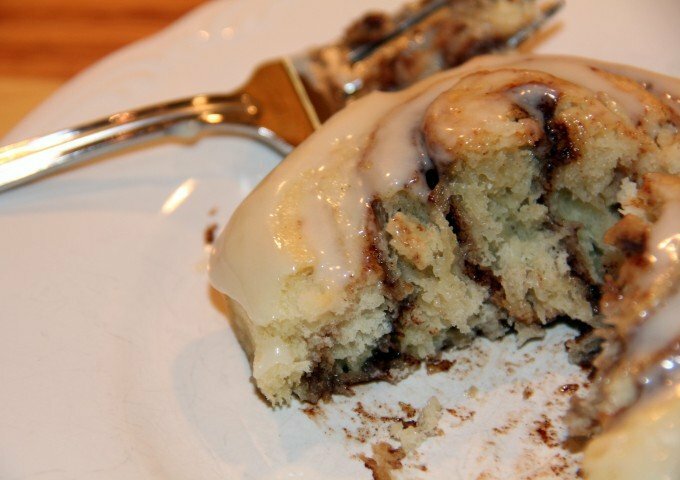 Cinnamon rolls don’t have to be hard and they don’t have to take all day to make either. These cinnamon rolls take just a little longer than regular biscuits, with no yeast and therefore no additional rise time. And they’re so, so good. I use my buttermilk biscuit recipe and add a little cream cheese and a little brown sugar. Mix the dry ingredients together then work in the cream cheese and butter. 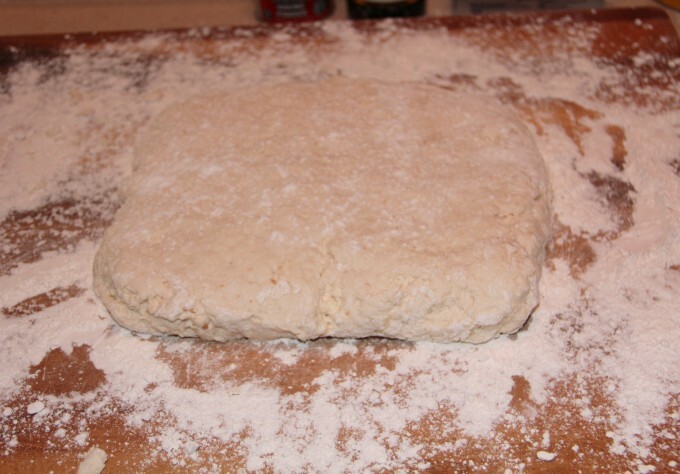 Once you have a workable dough, place it on the counter and shape into a rectangle. Now just roll the dough out to about a 1/4 inch thickness. 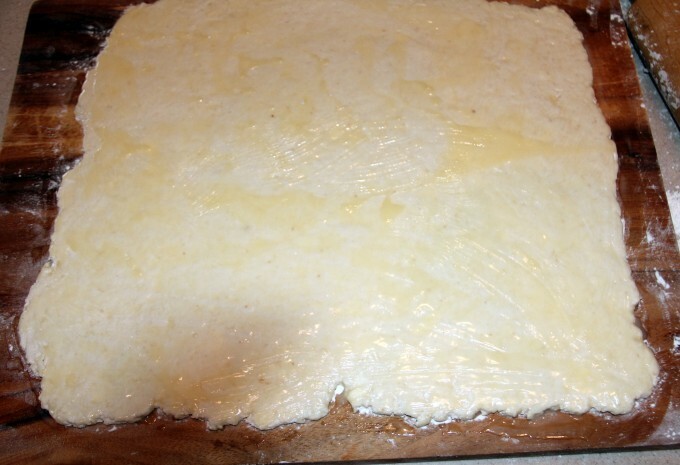 Next, melt 2-4 tablespoons butter and brush it on the dough. You want to completely cover the dough, which will help develop a nice gooey filling. In a small bowl, whisk together 1 cup of light brown sugar, 3 tablespoons cinnamon and a pinch of salt. 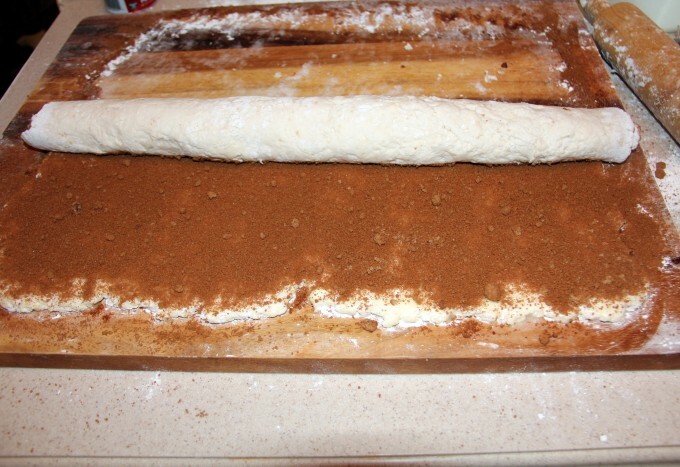 Spread most or all the filling over the dough, leaving the edge nearest you with a 1/2 inch border. Then take the side furthest from you and begin rolling toward you, keeping each roll tight so the rolls are not loose when done. When you reach the last roll, dip your finger in water and rub along the free edge then pinch the pieces together to close the roll. After the dough is rolled, you have a couple of options for slicing. You can either use a sharp knife and make a clean cut all the way through, or use non-minty dental floss to slice the rolls. I tried the dental floss but to me, it’s a pain to slip it underneath the dough every time so I’d just rather use a knife. Make your rolls about 1 1/2 inch thick. For this amount of dough, I usually fill up a 9×13 dish and a smaller dish. If you don’t want that much then you can cut the recipe in half or you can probably freeze some of the rolls. Lightly grease the dish you’re placing the rolls in and sprinkle a little of the filling in the dish. Carefully place the rolls in the dish, leaving a little space between each one. Now you must add more butter. This is a butter-friendly recipe. Melt a couple of tablespoons of butter and brush over the tops of the rolls. It will ooze down inside and add more gooeyness to the filling. 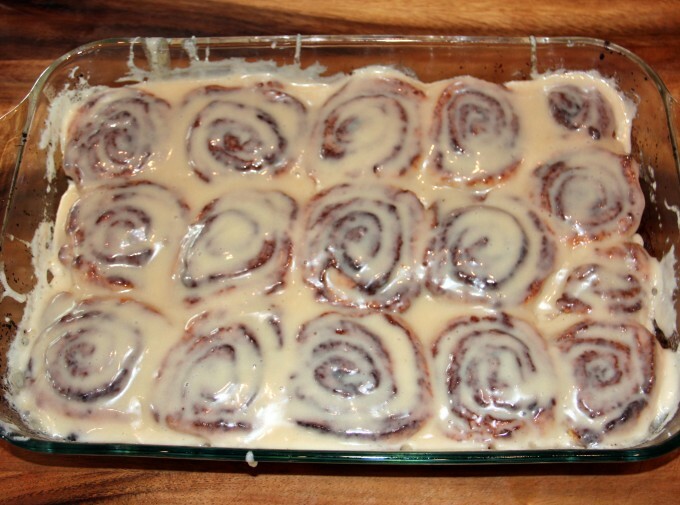 You certainly were not expecting a low-fat cinnamon roll recipe, were you? Place your dishes in preheated 425° oven and bake for 20-25 minutes, until just starting to brown around the edges. Remove from oven and place on a wire rack. While the cinnamon rolls are baking, take the remaining cream cheese (you used one ounce of the package in the dough) and mix with melted butter, milk, vanilla and confectioners sugar. 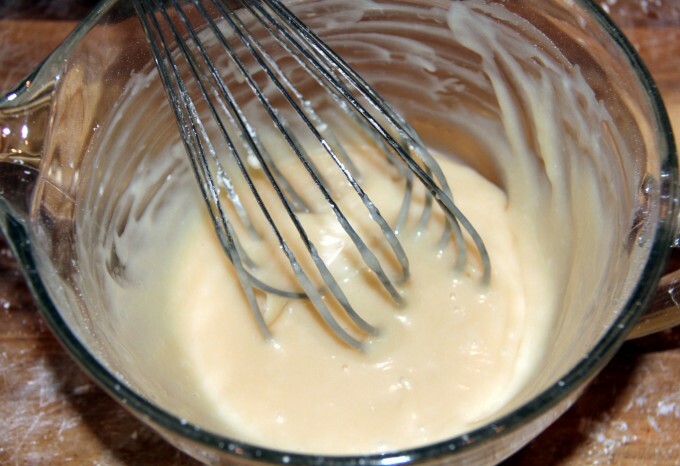 Mash and whisk together until smooth. I like to ice my cinnamon rolls while they are pretty warm so some of the icing melts right into the rolls. You can wait a bit if you want stiffer icing. Just pour over the top of the rolls and smooth out with a pastry knife until they are completely covered. This next step is very important so pay close attention. Remember back in the day when the King needed a poor sap to taste his food and make sure it wasn’t poisoned? 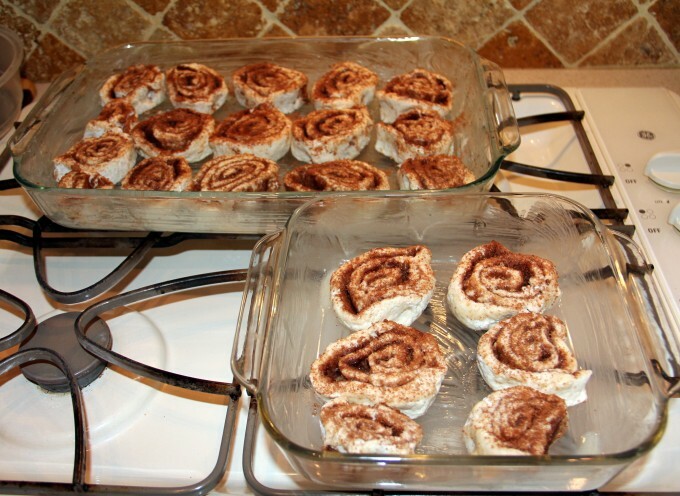 Well, you must taste these cinnamon rolls before you serve them to anyone…just in case. 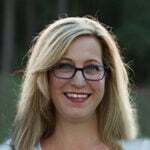 What if you added salt instead of sugar? You must protect your family. It’s your duty. Ooh. That’s just so good. I suwannee. Cinnamon Rolls without yeast means no waiting on dough to rise! These cinnamon rolls are filled with brown sugar and cinnamon and covered with cream cheese icing—great breakfast treat! Lightly grease a 9x13 inch pan and an 8x8 inch pan and sprinkle a little of the filling mixture in each. You can also use round cake pans, probably 3 or 4. Mix flour, baking powder, salt and brown sugar together until well blended. 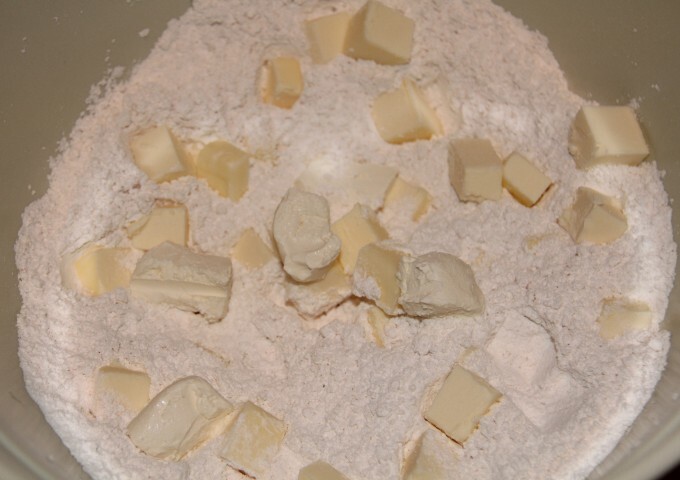 Add butter and cream cheese and mix in with fingers or pastry blender until crumbly. Stir in buttermilk. Sprinkle a little more flour and knead in gently until you can handle the dough enough to get it out of the bowl and onto the counter. 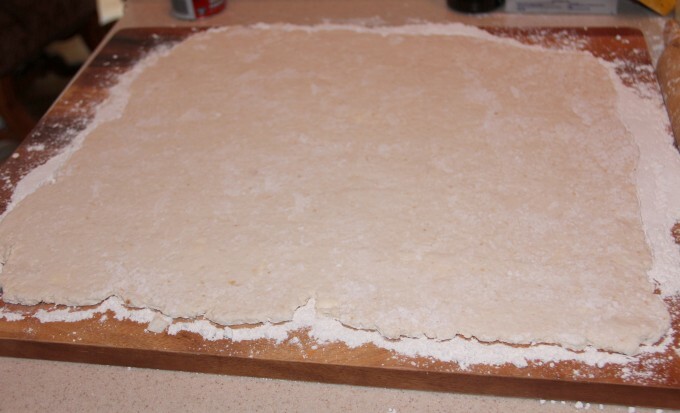 Shape dough into a rectangle and roll out to about 1/4 inch thickness. You may need to dip your hands in flour and sprinkle a little on the dough so you can handle it. Spread dough generously with melted butter. Mix brown sugar, cinnamon and salt until well blended. Sprinkle filling over the dough, leaving a 1/2 inch edge on the long end nearest you. Starting with the long end furthest from you, roll the dough toward you, making sure it's tight with each roll. When you reach the edge with no filling, dip your finger in water and rub along this edge. Then roll onto this edge and pinch together. The water helps seal the dough. Cut the rolls at 1 1/2 inch intervals and place in prepared dish. Brush the tops with melted butter. Bake for 20-25 minutes, just until the edges start to turn brown. In large bowl, whisk together softened cream cheese, melted butter, milk, vanilla and powdered sugar until smooth and creamy. Pour this icing over the warm rolls, covering each one completely. I buy it at Publix.